(CNN) On a stretch of parkland flanking the Mapocho River which bisects Santiago, Chile, a quilt-like covering encircles the glistening trunk of a palm tree. Nearby, overlooked by the Museo Nacional de Bellas Artes (Museum of Fine Art), wooden benches stand sheathed in geometric patterns woven from yarn. 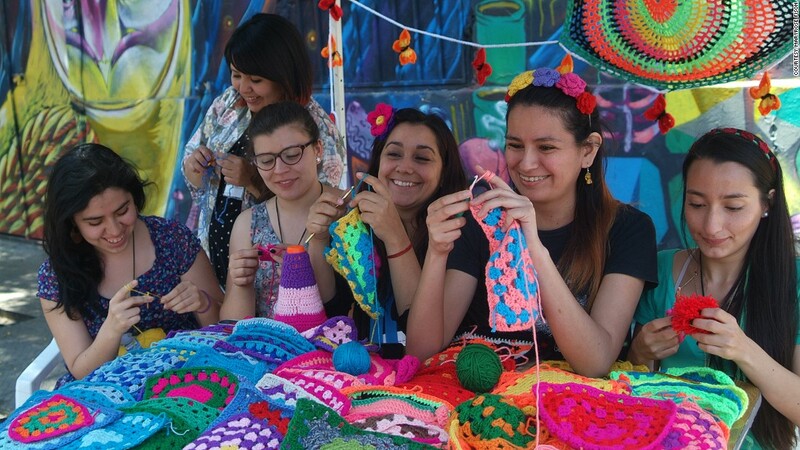 They are a few of the public objects that have been “yarn-bombed” in recent months, as a movement known locally as intervencines textiles has inspired imaginations across the South American nation. A far cry from the marble sculptures displayed in the nearby museum, the trend that began in Texas in 2005 has seen a growing number of open spaces transformed with woolly creations reminiscent of giant tea cozies. The interventions may be little more than a whimsical fad to some, but to Claudy Tapia Retamal, who founded the yarn-bombing collective Lanapuerto (wool port) in Coquimbo, a coastal town in northern Chile, it’s a social project with far-reaching goals. Tapia Retamal, who earns a living as a fashion designer, says she’s trying to debunk outdated assumptions while drawing people into playing a more active role in their community. “When I founded the group, the goal was to smash stereotypes,” she says. “Knitting is no longer just for grannies. It’s for women, men and children. So far, the group has yarn-bombed a fishing boat, the control towers of two industrial cranes, several bicycles, and a large stretch of railing. The structures that proved most difficult were the control towers on the port’s 98-foot industrial cranes. Since they were located on a private site, there were a number of health and safety rules to observe. It’s a bold ambition that has come with challenges. Displayed in open air, often in crowded places, the interventions can be used or abused by passersby at will. Both groups have seen their work torn off, sometimes minutes after being put up. On one occasion, a local took a lighter to the wool and set it on fire. But for the most part, the interventions last several weeks, and sometimes much longer. 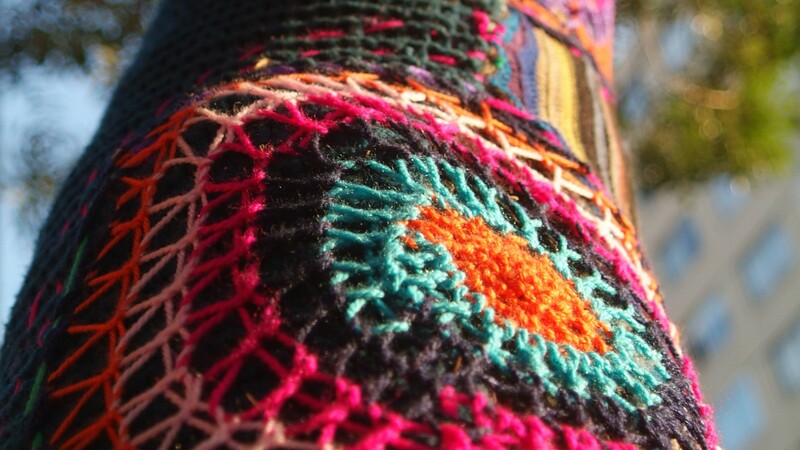 The temporary nature of the art is particularly relevant for Wen Roh Lee, who combines yarn-bombing interventions with charity work through the club Tejiendo Juntos Chile (Knitting Chile Together). The 31-year-old engineer covers palm trees and park benches during the day, before donating the creations to orphanages and homes for the elderly in the evening. But in a country famous for punctilious respect for the law, yarn bombers risk brushes with the local Carabineros (national police force). Without a permit to place yarn over public objects, they can be fined. And in Chile, even a minor criminal record can have catastrophic consequences for an individual’s career prospects. 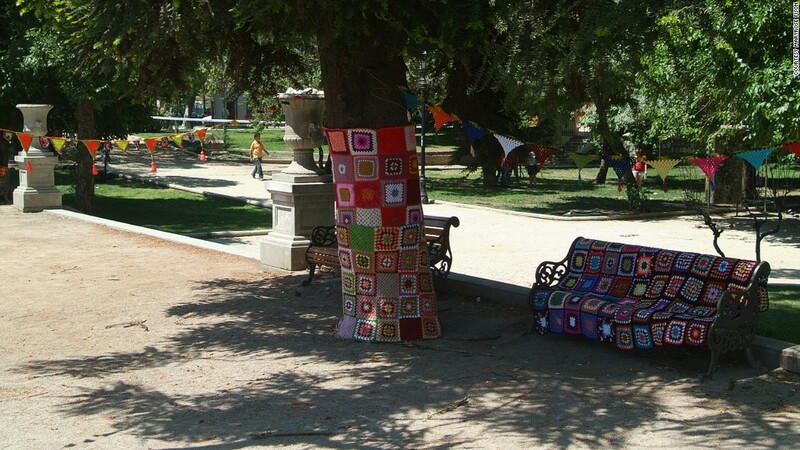 In an environment where machine-made goods dominate and social interaction has become increasingly digitized, Chile’s yarn-bombers offer a refreshing take on an ancient craft that harks back to a time when communities were, truly, closely knit.